The Caisa App – Released! DOWNLOAD it HERE! Say welcome to the first app from rushworks for Apple’s iPhone as well as for Smartphones. This application emulates an instrument named Caisa COSMA, tuned F-Major, built by Bill Brown in Munich, Germany. 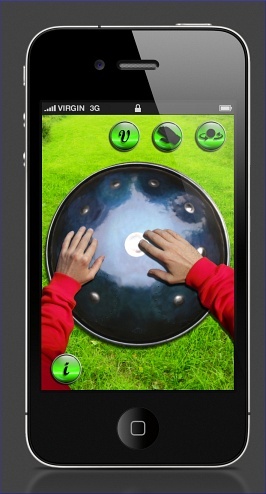 There are similar apps around, featuring other steelpans (Hang, Halo, Bell to name a few) which belong to the same family of instruments, the idiophones. Now we wanted to complete the road with this app. Simple handling; just tip on the silver dots and play melodies as well as repeating patterns. Also there are areas to play on, featuring not tone fields but the rim of them. 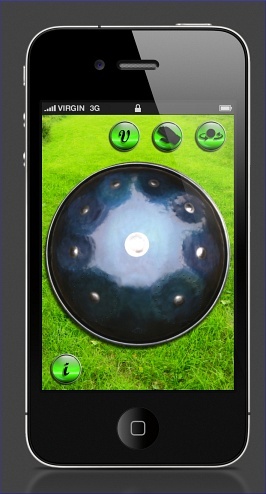 This provides you some interesting additional sounds to fill in percussion-like effects. Aside of this, you can flip the whole instrument by pushing the rotate-icon. Why the heck, should I…? A funny gimmick is, you can let real hands appear on the display, virtually playing the Caisa. This feature can be turned on/off. 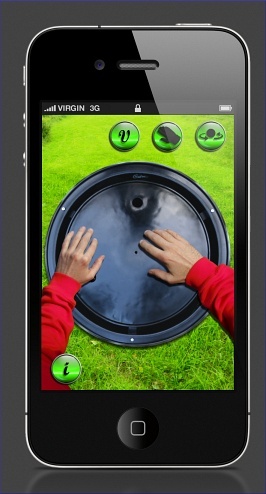 Also included is a short video, that shows how to play the instrument in real life. and here for your iPhone. Let us know how you like it and show us your playing skills on that virtual steel. The best videos will be published, here, in our blog. Provide us a link to Youtube or similar platforms, that’s the most smart way to become part of the race. iDevices Apps tested by a Pro Musician.